‘DE STIJL’ DESIGN MOVEMENT ? 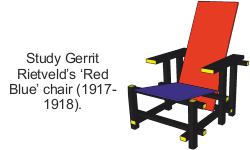 The De Stijl Design Movement (also called Neoplasticism) originated in Holland in 1917 . It promoted a style of design based on a limit range of colours (primary colors, red, yellow, and blue), used in conjunction with a combination of horizontal and vertical lines. De Stijl’s true origin can be traced back to Cubism. Also, the artwork of Piet Mondrian greatly influenced the De Stijl colour scheme and style. A limited range of colours (primary colours, red, yellow, and blue) are used. The colours are used in conjunction with a combination of horizontal and vertical lines. Each part is regarded as a single aspect of the design / product, one of several parts. Each part should stand out. The materials used in the manufacture of a product, are likely to be ‘modern’, rather than traditional. 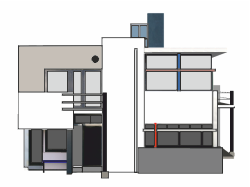 ‘The Rietveld Schröder House’ (built in 1924), designed by Gerrit Rietveld, which also included furniture and fittings in the De Stijl style. UNESCO World Heritage Listed. A radical design for the 1920s, similar to a Bauhaus style, although asymmetrical. The two storey building has separate rooms downstairs. Upstairs it is an open space, with moveable panels to allow the layout to be altered. Go to the Designers Section of www.technologystudent.com for more detail and exercises on designers and companies.